Check the "First row is a header" option if the file looks like it has column titles in the first row. These will help you assign fields to your columns. Amount - This is a critical field and must be assigned to a transaction unless there are two amount columns (see below). 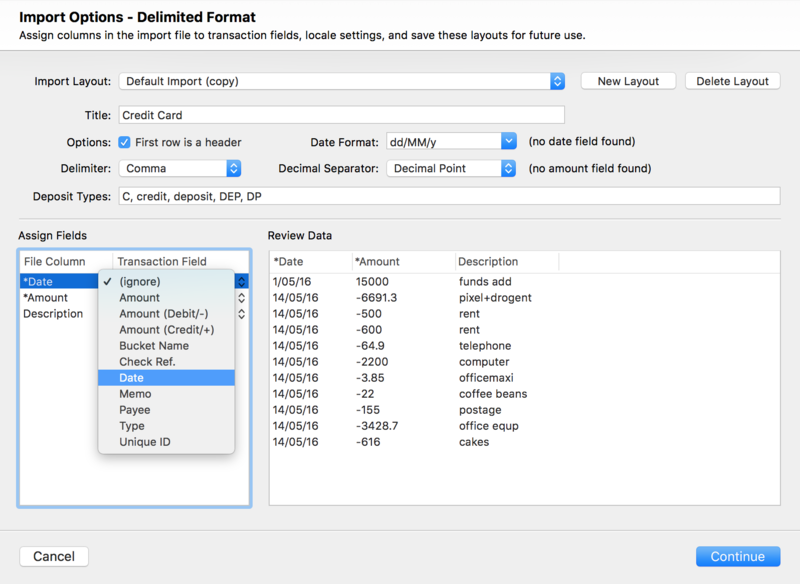 Amount (Debit/-) - Use this amount field if you have both credit and debit columns in your file. This is for the debit or negative numbers. Amount (Credit/+) - Use this amount field if you have both credit and debit columns in your file. This is for the credit or positive numbers. Bucket Name - This is an optional field and is rarely included in delimited files. Using this will assign a bucket to the imported transaction based on the information in the file. Check Ref. - Only select this field if the column truly contains check numbers. If there is a check number during import, MoneyWell will set the type to Check and force the amount to be negative. Date - This is a critical field and must be assigned to a transaction or it will have no date. Memo - This is an optional field and will assign the column value to the memo of the transaction. Payee - This is a critical field and should be assigned to a transaction. Type - This is optional field and rarely used. Do not use it unless the amount is always positive in the file and the type column is the only way to determine debit versus credit. Unique ID - This is an optional field and rarely used. If you use this, make sure these values are indeed unique. If not, MoneyWell will discard duplicate transactions with the same value in this field and your imported information will be incomplete. Don't assign the same field to more than one column. You may think that using the memo field multiple times concatenates the values, but it won't. Don't use the Amount field if you are also using the Amount (Debit/-) and Amount (Credit/+) fields—pick the one or use the pair. If you use the Type field, make sure that the common name for the deposit type is in the comma-separated "Deposit Types" string. Once you have the settings correct, give the layout a name. Click New Layout before making any layout changes if you want to keep an existing layout. MoneyWell automatically links the selected layout with the selected account after you perform an import. This means that the next time you select an account and try to import a delimited file, the proper format is automatically chosen for you.